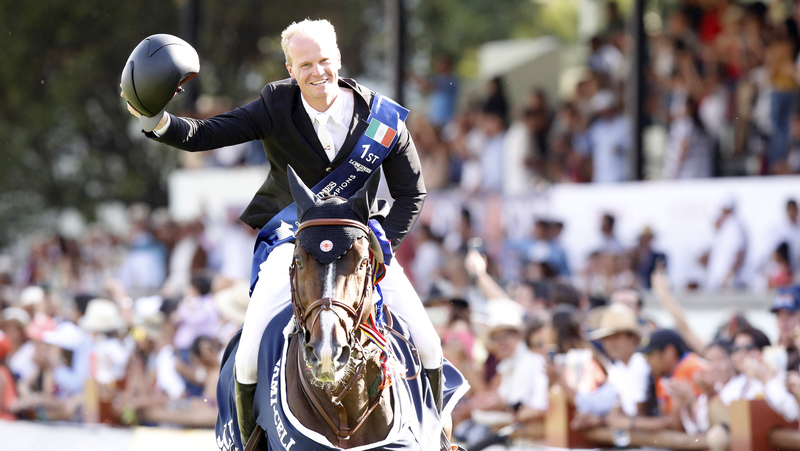 Belgium’s Jerome Guery and Quel Homme de Hus pulled off a glorious victory in the Longines Global Champions Tour Grand Prix of Mexico City. Guery and his powerful bay stallion emerged triumphant after an exhilarating 12-strong jump off at the stunning Campo Marte show ground earning him a precious ticket to the LGCT Super Grand Prix at the GC Playoffs in Prague in November. Guery threw up his hands in sheer delight when his victory was confirmed after he pipped Egypt’s Abdel Said (EGY) who came in second with Dutch champion Harrie Smolders (NED) in third. Stunning views of the expansive grass arena to the burgeoning City skyline set the scene for a Grand Prix thriller. With the giant Mexican flag flying overhead fans lined the arena and guests took their seats in the large hospitality lounges as 31 rider and horse combinations went into battle. In the first round there were disappointing exits including the USA’s Kent Farrington, Jos Verlooy of Belgium, Beezie Madden (USA), Shane Breen (IRE), Olivier Philippaerts (BEL), Denis Lynch (IRE) and Pieter Devos (BEL). Ben Maher (GBR) and Madame X had a round to forget ending in 12 faults. Last year’s Mexico City LGCT Grand Prix winner Scott Brash (GBR), this time riding Hello Senator, didn’t quality for the jump off. But a dynamic dozen of the world’s finest riders did win through to the climax of the 1.60m competition. Simon Delestre (FRA) and the chestnut gelding Uccello de Will delivered a faultless clear under bright blue skies setting the time to beat at 42.65 to the delight of the big crowd. Niels Bruynseels (BEL) set off in top gear but finished on 8 faults. Germany’s Daniel Deusser and Calisto Blue hit the accelerator but finished in 43.29 despite a superb effort. There was delight from Eric van der Vleuten (NED) riding the big striding chestnut mare Wunschkind as he took the big Banorte fence on an angle and continued to finish clear in 41.71 and into the lead. But it was to be short-lived as fellow countryman Harrie Smolders and the formidable Don VHP Z made easy work of the course to come in a second faster and take over the lead in 40.74. Laura Kraut (USA) and Zeremonie set off at a blistering pace but picked up 4 faults at the GNP water tray and another 4 at the Longines vertical. Bertram Allen suffered a similar fate with Molly Malone V clocking up 8 faults as they chased the leading times without success. As the temperature rose around the arena Abdel Said (EGY) and Venise du Reverdy set off at a cracking pace and executed super turns at key points in the course to take the lead in 40.53 to loud cheers around the arena. Ireland’s young star Michael Duffy and the bay gelding Quintano could not capitalise on their impressive first round and finished on four faults at the Longines combination. Jerome Guery and Quel Homme de Hus set off at a scorching pace and pulled off a brilliant handbrake turn after the second fence and the Banorte obstacle before stopping the clock at a winning 39.57. Sweden’s Peder Fredricson and H&M Christian K were swift and polished but put in a time of 41.14 and the final rider Maikel van der Vleuten and Dana Blue picked up 4 faults at the Longines combination. The third leg of the LGCT and GCL Championship race takes place next week in the dazzling destination of Miami Beach on the shores of the Atlantic Ocean as the 20-event circuit gathers pace. For the full results, please click here.